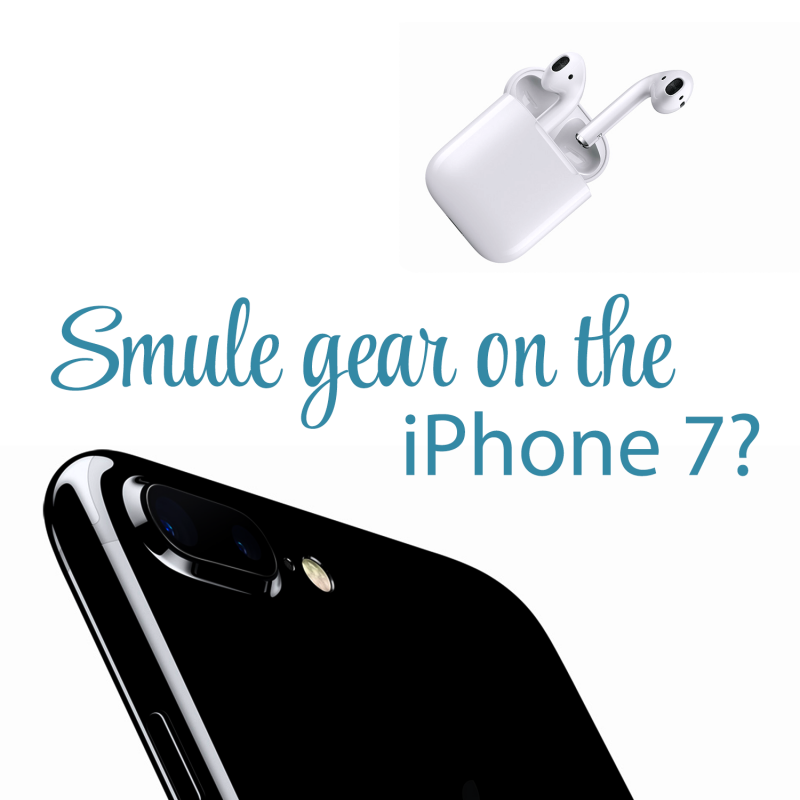 Does my Smule gear work with the iPhone 7? The rumor about Apple removing the headphone port from the iPhone 7 has sparked a lot of discussions—even months before the official release of the device. Users of Sing! Karaoke app were also worried all their Smule gear (microphones, headsets, earphones or adapters like the iRig PRE) might stop working. Now that the iPhone 7 was officially released, we can take a look at what works and what doesn’t. Apple’s so-called EarBuds now come with a lightning cable (see image above) since the headphone socket is indeed gone. But you can still connect all your existing devices you plugged into previous iPhones and iPads—and you don’t even have to buy an additional adapter, since it is already included with the iPhone 7. If you plug this adapter into the lightning port of the iPhone 7 the phone will work like any previous iPhone with a headphone jack. The adaptor provides the same analog input and output and all your old gear will continue to work with the iPhone 7. Hurray! The Bad News: One Socket Less. With previous iPhones and iPads you might have used both sockets at the same time. For example, to use a headset with the analog audio socket and to charge your phone at the same time using the lightning socket. Or you might have used an external microphone like the Apogee MiC with the lightning connector and headphones with the analog audio socket. Well, you can’t do that anymore. At least not easily. The lightning connector is now the only socket and because of the way this connection works, there aren’t even true hubs available to connect multiple devices at once. Apple’s recommendation is to go wireless. With the iPhone 7 they are also introducing a (rather pricy) wireless headset called AirPods, but there also many wireless headsets available from other vendors. A solution to connect one adaptor or lighting device (like a microphone or headphone) and still charge the device at the same time comes from Belkin and costs around $40. It’s called Lightning Audio + Charge RockStar. With it, you can continue to use your older gear meant for the 3.5 mm audio socket and still charge your device at the same time—but you need to plug in two adaptors at the same time and so it gets pretty messy. Another option for your desk or nightstand might be the Apple dock. You can charge the phone by connecting the dock through a lightning cable and there is a headphone socket to connect regular analog headsets or earphones. I read that the headphone socket on the dock would be a combined headphone/mic input socket like on the older iPhones. In that you could also use it to sing with a headset or adaptors like the iRig PRE—but I haven’t seen any official confirmation about this from Apple. Another way to provide power to an iOS device and/or to an external device like a microphone is through Apple’s Lightning to USB 3 Camera adaptor. Official support is only guaranteed for iPads, but people have also successfully used it with iPhones. Singing with people from all over the world on the Sing! App is great, but if you want to really spice up your collabs try adding some harmonies. Experienced singers will often just create them by ear. Over time you just get a feeling for scales and chords and you learn to create melody variations and harmonies while singing. But what if you want to learn to sing harmonies from scratch? Just follow our two-part article and we will teach how to do it! If we go one note higher, we have closed the circle and end up at the octave. The frequency of the upper C will be exactly double the one of the lower C and as a result their waveforms match up in a way that we perceive them as the same note, even though the frequencies are different. And that is why we can sing any song in different heights as long as we hit the right notes within the different frequency ranges. But now back to finding the harmony notes: If we omit the one note the melody is using at a given time, we narrowed down the choices for a harmony note to just 6 possible options within the given key. While all 6 options might be used in more complex arrangements, some notes do work better than the others, especially for beginners. The most typical and basic harmonies are parallel thirds and fifths. So the whole movement of the melody is repeated, but shifted 3 or 5 notes above the melody. So in the key the song is using, count up from any melody note as first note (let’s say C), skip the next one (D) and then sing the 3rd note (E) as harmony note. That’s it! If you manage to sing this note and you can resist the urge to also sing the base note of the melody the duet partner is singing, you managed to sing harmonies. Thirds as harmonies are especially popular. You can hear them in pop arrangement all the time—or in musicals for example. Even if you haven’t learned to read musical notation: Take a look at this excerpt from a song from the Lion King. Both voices (male and female) start out with individual parts in the song and then both voices sing a finale together with harmonies. This part uses thirds and ends in a more open fifth. Very simple, but very effective! Expert tip: As we have learned, the octave we are in doesn’t matter much in regards to the perceived note. So instead of going up 3 or 5 notes in the key, we can also go lower and sing the equivalent notes an octave below. In that case, going down 6 equals going up 3, and going down 4 equals going up 5. So if the melody is already so high that you can’t go further up, sing the thirds and fifths an octave down. Now that we have understood the basics, let’s try it out! Here is a simple melody in C major created for the purpose of this article. Click play and get familiar with the melody which is played first. After that comes the harmony part alone. It is based on thirds. Listen carefully! It’s an advantage of thirds that the interval to the base notes is rather small. But it can be a disadvantage as well if you struggle to keep that interval and fall back to the melody line. In the third round the melody and the harmony are played together. 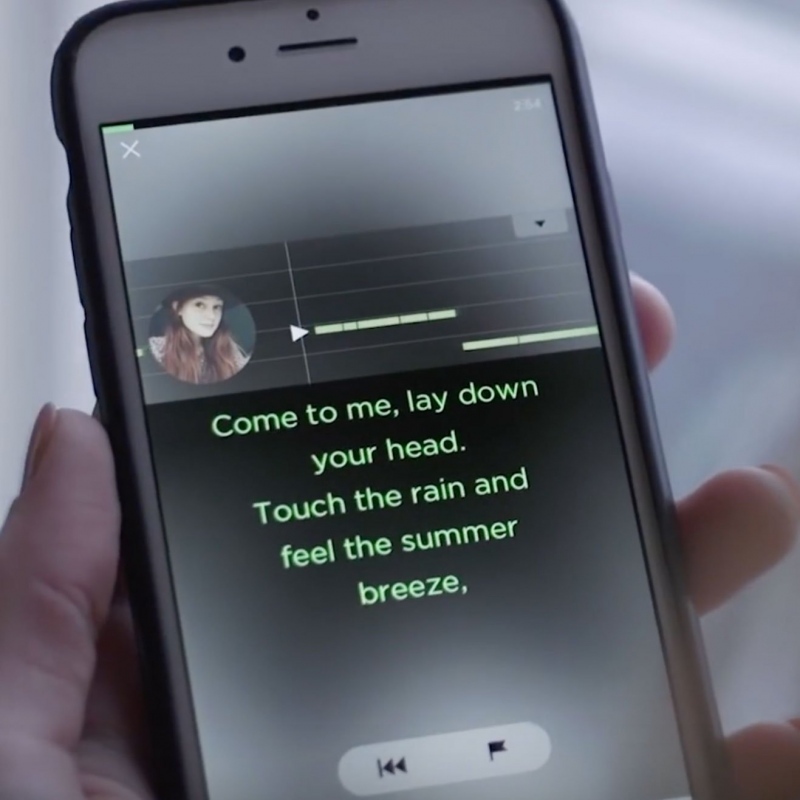 If you managed our beginner’s exercise, try practicing this technique with other songs on Smule. The rewind function (on the iOS version) makes it easy to practice a part until you get it right. If you can’t manage to sing the harmony part, because the melody in the OC is too dominant and distracting, start a test OC yourself and practice the harmony line without a melody. If you can play an instrument, you can find or look up the original melody and then shift the notes to thirds and play them to memorize the harmonies. If you don’t play an instrument, try to find the first note of the melody, sing it and move up the scale to find the first harmony note. Then try singing the shifted melody without background music first. If you feel comfortable singing it, try it with the music and the melody. The more you practice this, the easier it will get to hit the thirds or even fifths without even having to listen to them first played by an instrument or sung by someone. 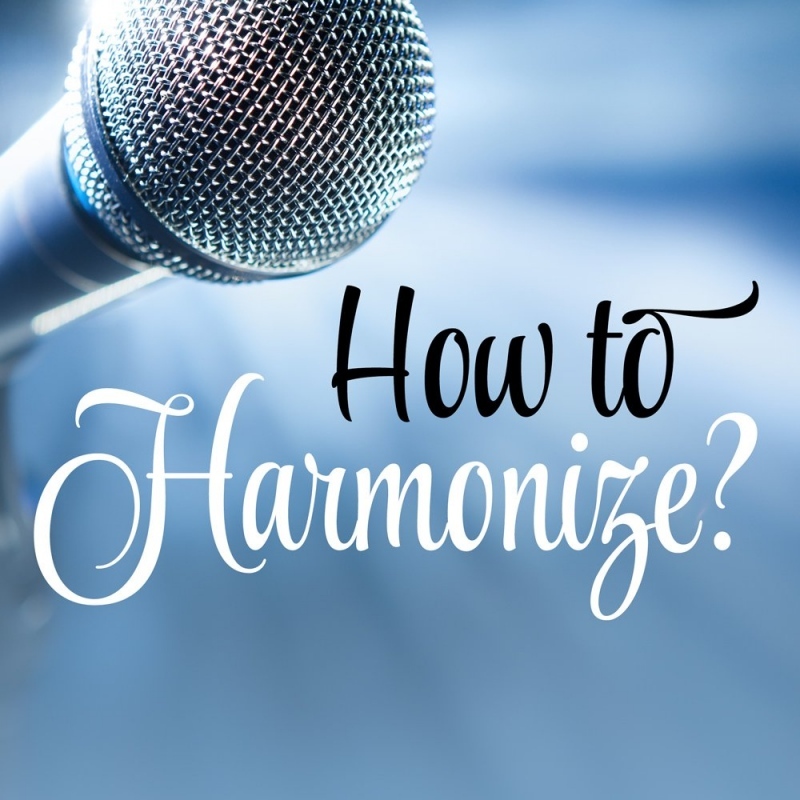 While parallel harmonies on thirds and fifths are usually pleasing to the ear and work with many songs from many genres, they aren’t always the best choice. There is a certain tonality to these harmonies which might not always be desirable and since you are just replicating the melody, there isn’t much creativity and tension in these harmonies. So in the follow-up article we will look at options for more interesting and creative harmonies. Sign up on Sing Salon so you don’t miss it! Professional microphones use the XLR connector standard with three pins. Today’s phones and tablets use a 3.5-mm 4-conductor audio jack for analog audio input (microphone) and output (headphones). It is basically a tweaked headphone socket with an additional connection for the microphone to save the room for a dedicated microphone input socket. As a result, you can plug any headphone with a 3.5-mm jack into your phone, but not any microphone. The microphone cable needs to be specifically made to work with these 4-conductor phone sockets. So even microphones with a 3.5-mm phone connector, which might work for your computer or digital camera, won’t work with your phone or tablet without an adaptor—even though the jack fits in the socket. And XLR microphones aren’t meant to be plugged into phone ports at all. Professional microphones, especially the ones used in studios, are often condenser microphones. They require a permanent power source to work. If you just plug a condenser mic in a regular mic input, you won’t hear anything at all. To make a condenser mic work with Smule, you not only need an XLR to phone connector adaptor, you also need to provide the necessary phantom power. But luckily there are several devices available to achieve this and they aren’t even that expensive. A common choice is the iRig PRE, which I use myself. You can plug in any XLR microphone including condenser mics. The phantom power is provided by a battery which lasts for about 10 hours (or 30 for dynamic microphones). There is a gain control knob on the side of the iRigPRE. You need to play around with it a little bit to find the perfect setting, so the mic input signal in Smule is neither too high nor too low. There is an additional headphone socket on the device, so you can still hear the audio signal from your phone or tablet. However, the sound quality is not as good as when you plug the headphones directly into your phone or tablet and the buttons of the Apple EarBuds also stop working. The iRigPRE output is an analog audio signal, so you can be sure it works with any app that supports the regular mic input port (so basically all of them). There is also the much more expensive iRig Pro I/O, which has a digital output and connects to your device through a lightning or USB cable. This should provide a better audio quality with less noise, but I haven’t tested it myself and can’t say if it is compatible with the Sing! app. Similar to the iRigPRE, both in price and functionality is the TASCAM iXZ. The advantage of it is that the input socket does not only support XLR jacks, but also 6.35-mm jacks for guitar/line input. As with the iRigPRE you can be sure this works with Smule and any iOS device with a 3.5-mm headphone socket. The discussion section below this article has been closed. If you have more questions regarding this topic, please use the forum. The many questions can be structured and answered better there. Has this ever happened to you: You join a video OC and everything works fine, right until that tricky part at the end which you then mess up. So you start over only to screw it up once more. Frustrating, right? So here is what I usually do to avoid this problem and save some time. Instead of going straight for the video join, do an audio join first. You are probably aware that you have access to a rewind function here. The markers are set automatically and as a result you might not end up where you want. The jumps might be too small or too big. So use the flag symbol instead to set a custom marker. Once you have set such a marker, the automatic markers become inactive and you can always jump to that one position you have set yourself—until you set a new custom marker later in the song. With these custom markers you can easily practice specific parts of the song. Whenever it is your turn, set a custom marker right in front of that section. If you manage to sing the part without problems, just continue. If you struggled, hit the rewind button and try that section until it works perfectly. With this method you save a lot of time, since you only practice the tricky parts over and over again, without the need to go through the entire song. Once you have managed the audio-only practice, abort the audio join and start the video join instead.